Usher and Scooter Braun join Justin Bieber in Panama for a "Save Justin Summit"
According to reports, Usher has flown to Panama for a sit down with Justin Bieber. Sources close to TMZ report Usher flew to Panama for a serious come-to-Jesus with JB following his much publicized arrest in Miami. Sources also report Justin's manager Scooter Braun, and Justin's childhood friend Ryan Butler, are also there for the sit-down. It would be no surprise to me if Scooter has his own sit down with Usher. Scooter has been MIA during most of JB's public exploits, only coming out of the woodwork after Justin's arrest in Miami. A tweet posted by Scooter just goes to show his further avoidance of addressing any Bieber related issues head on. Scooter has been conspicuously absent through Bieber's very public downward spiral. This appears to me to be a strategy to keep the Bieber machine going. It's PR 101, really. By refusing to comment on the escalating lapses in judgement by his client, Scooter is attempting to dismiss the events as being blown out of proportion by the media and not worthy of comment. Behind closed doors, damage control is kicking into high gear. 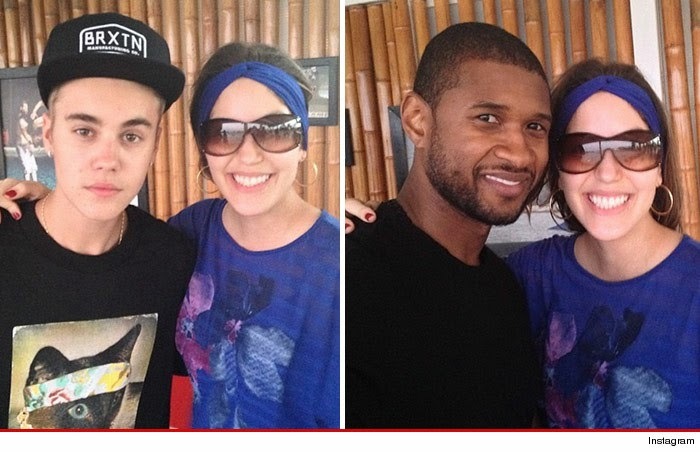 Justin, Usher and a reluctant Scooter Braun, posed for pics with a woman who appears to be a Panamanian Belieber. Worth noting... even the fan who posted the Usher pic acknowledges Justin has hit rough times, describing him as "the youth idol who some love and many others hate."